Surrounded by friends, family and a healthy crowd of hockey fans at the Consol Energy Center in Pittsburgh, PA, many of the game's best young prospects took the next step in fulfilling their dreams of becoming NHL stars during the first round of the 2012 NHL Entry Draft. On a hot and humid night outside, the atmosphere inside the arena was vibrant as fans were witness to high-profile picks, as well as a few trades of some big-name NHLPA members that had the floor buzzing. The Edmonton Oilers started the 2012 NHL Draft festivities by picking Nail Yakupov of the Sarnia Sting with the 1st overall pick. Yakupov was tabbed by many hockey pundits as the favourite to go to Edmonton in the first slot, but, in a draft full of such a large number of talented hockey players with top-end talent, no one knew for certain until Oilers GM Steve Tambellini announced the team's pick on stage. Following Yakupov on the draft board was Ryan Murray of the Everett Silvertips, who was selected 2nd overall by the Columbus Blue Jackets. Murray, a defenceman, had been rumoured to be potentially moving up the board and going to Edmonton after showcasing his skills for Oilers president Kevin Lowe at the recent IIHF World Championships. But once Yakupov was announced at #1, the Blue Jackets were happy to take Murray in the #2 spot. The Canadiens rounded out the top three selections by selecting Alex Galchenyuk of the Sarnia Sting with the 3rd overall pick. The skilled pivot, who missed a large chunk of the season with a knee injury, brings size and offensive abilities to the Canadiens organization that will undoubtedly be welcomed by the hockey faithful in Montreal. The host Pittsburgh Penguins showed the hockey world how to make a statement while hosting the Draft when they announced a blockbuster trade early on in the first round. The Penguins traded center Jordan Staal to the Carolina Hurricanes for Brandon Sutter, the Hurricanes' 2012 first-round pick and prospect Brian Dumoulin. The Penguins also made two first round picks, selecting Derrick Pouliot of the Portland Winterhawks with the eight-overall pick that they acquired from Carolina, followed by Olli Maatta of the London Knights with their own pick at 22nd overall. A number of other trades were made on Friday during the first round, including Mike Ribeiro moving from the Dallas Stars to the Washington Capitals in exchange for Cody Eakin and a 2012 second round pick and Lubomir Visnovsky being traded from the Anaheim Ducks to the New York Islanders for a 2013 second round pick. Some other highlights from the opening round of the Draft included highly-touted young defenceman Matthew Dumba of the Red Deer Rebels being drafted 7th overall by the Minnesota Wild; offensively-gifted Mikhail Grigorenko of the Quebec Remparts sliding down to the 12th overall position where he was selected by the Buffalo Sabres; Cody Ceci, who has been plying his trade for the Ottawa 67's of the OHL, was taken by his hometown Senators with the 15th overall pick; and Malcolm Subban being selected 24th overall by the Boston Bruins, making him the first goaltender chosen in the draft. With the first round of the draft complete, the 30 players selected can cherish the lifelong goal they've now reached while setting their sights on their next one – playing in the NHL. 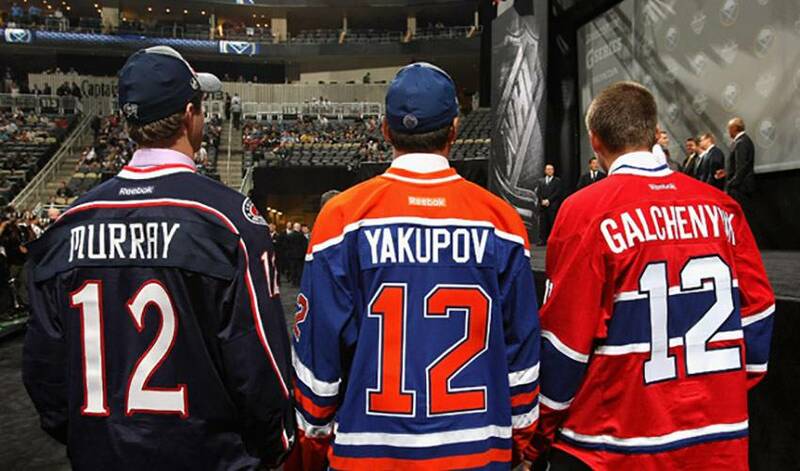 Rounds 2-7 of the 2012 NHL Draft will take place on Saturday in Pittsburgh. Thirty of the top NHL rookie prospects will gather outside of Toronto at the MasterCard Centre on Tuesday, August 28th for the 2012 NHLPA Rookie Showcase.